Designer Rose McMonigall was helped by members of BBC’s Pilgrimage: The Road to Santiago cast, Neil Morrissey, Raphael Rowe and Reverend Kate Bottley to officially open her silver medal-winning show garden at RHS Hampton Court Palace Flower Show. Rose brought to life the breath-taking Atlantic coast of north-west Spain in the show garden collaboration with the Spanish Tourist Office and Tur Galicia. 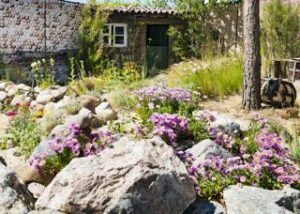 The RHS Hampton garden, which scooped a silver RHS medal, evoked the extraordinary landscape of the Rías De Galicia; the estuaries on the rugged Galician coast. Secluded coves are dotted throughout this region and McMonigall celebrated these coastal havens, their wild flora and the local tradition of shell-cladding, as well as giving a nod to the delicious local seafood. This is the third garden Rose McMonigall has designed for the Spanish Tourist Board at RHS Hampton. Last year she created The Pazo’s Secret Garden and in 2016 The Route of the Camellia both of which were award silver gilt medals. For further information on Spain or Galicia as a visitor destination, please visis www.spain.info or email Spain@wearelotus.co.uk.